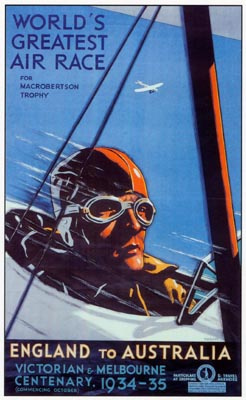 Welcome to the 2019 MacRobertson Air Race - a reenactment of the 1934 race from England to Australia (also known as the London to Melbourne Air Race). 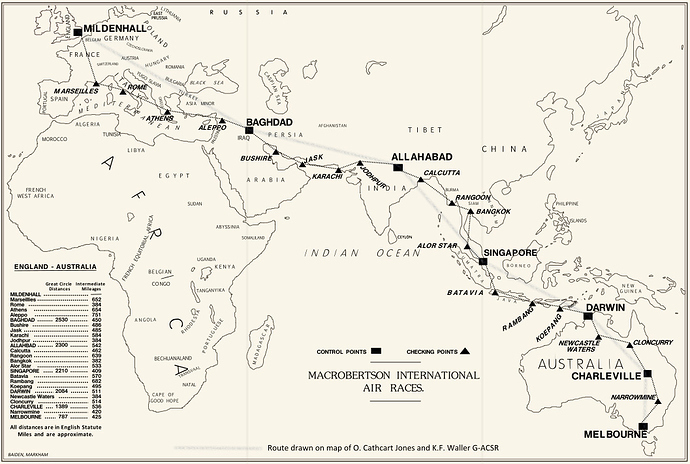 Pilots will select an aircraft (or series of aircraft) and complete the route from Mildenhall in the UK to Melbourne Australia, in the fastest time possible as governed by the rules. All pilots should compete in the Spirit of Fair Play (SoFP), taking no action that would intentionally garner them an unfair competitive advantage over their rivals. Any simulator may be used provide it covers the land area being flown over (you want to take a Yak-52 across the Persian Gulf, totally good with it). Simulators can be changed at any time. Any scenery, land class, etc is allowed as the pilot prefers. Scenery choices should be made to increase the flying experience and not to confer an advantage. Experiential class - Anything you have in a sim is good to go (if you want to fly an SR-71, or do an orbital insertion, go for it). Air Race class - pre WW2, encompassing any AC built and launched prior to 1939. 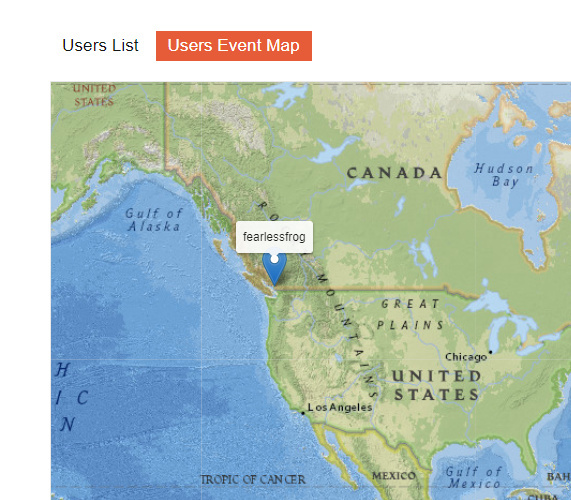 You can also access the event map by going to your “hamburger menu” (the three horizontal line menu) in the upper right corner of this page next to your user icon, and selecting USERS from that drop down. Launching from RAF Mildenhall, you must land at each checkpoint (airport, or rough field landing is up to the individual flyer), with the ending point being Melbourne Australia. Any intermediate stops are solely at the discretion of the pilot. Route selection besides reaching the listed major checkpoints is entirely up to the pilot. Time acceleration - Time acceleration is allowed, and any acceleration setting desired my be used. Timing - Pilots will be responsible for tracking their own time and mileage. They should post a running total of both with their reports, though this can be amalgamated if several legs are flown and reported in one post. Reporting - Pilots should, in their best 1930’s news writer impression, report their travels along the race route. Unless you’re flying in the Air Race class, that’s it for the rules. All pilots should compete in the Spirit of Fair Play (SoFP), taking no action that would intentionally garner them an unfair competitive advantage over their rivals. Planes may be changed at any time so long as it is eligible for the Air Race class. 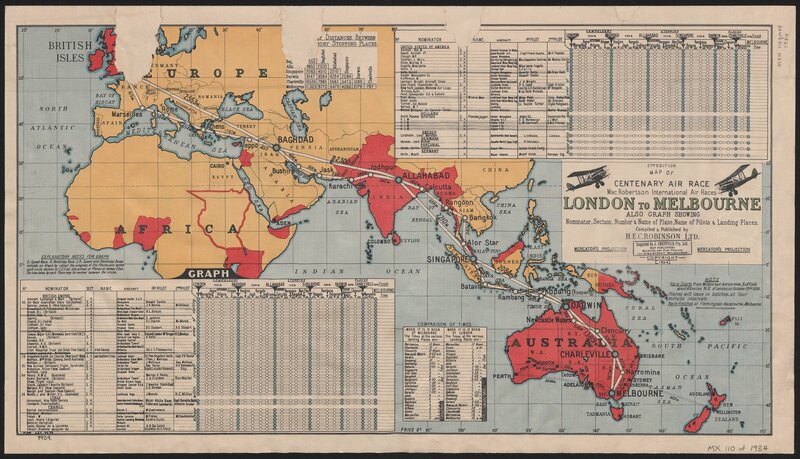 Navigation - As we are somewhat simulating a 1930’s airspace environment, GPS, SatNav, Radar Nav, etc didn’t exist. Pilots are PROHIBITED (with the emergency section listed below) from using any map, gauge, etc that displays their position without requiring manual calculation by the user except as listed below for Radio Navigation. For example the default FSX GPS gauge and flight tracking map are a no go. Using a Sextant gauge, taking a star shot, plotting it on google maps, etc. is totally good. Addon GPS or nav systems, inertial, doppler, etc, are prohibited as well. In short in the SoFP if something is automatically doing navigation for you, it’s prohibited. *Remember we’re trying to capture the spirit of the 1930’s when even accurate paper maps could be a rarity. Getting lost is half the fun! Radio Navigation was a thing back then, but to be honest, I’m am not terribly familiar with what was available back then. Early RF options basically could fix and locate radio signals similar to an NBD, including local AM stations. For our purposes the closest capability we have to that is NBD’s. NBD’s may be used for navigation purposes, provided this does not run afoul of the preceding paragraph. Emergency Navigation Assistance: We are all probably going to get lost (well I am at least). To simulate the real world capability to land and simply ask “Where the heck am I? !” safely landing your craft will allow for the use of a real time/exact location system (default FSX map or GPS for instance). Autopilot - Any pre-WW2 craft that was equipped with some manner of “autopilot” may use it during any portion of flight, provide it behaves in a reasonably similar fashion as it did historically. Weather - Real world weather should be used at all times, except if in True Explorer Spirit™ the pilot elects to have more difficult weather. If real world weather is not available for that area, default seasonal weather (if your sim has that) is allowed, or if that is not available, cloudy (but VFR) weather as determined to be in the SoFP by the pilot will be used. ATC - ATC will not be used in a manner so as to gain an unfair advantage. So no IFR flight plan, where you don’t have to do any navigation, etc. Thanks to @Jenrick for proposing this race and coming up with the proposed rules! Good luck pilots! You can also find the ‘Users Map’ in the hamburger menu on the top right as well. 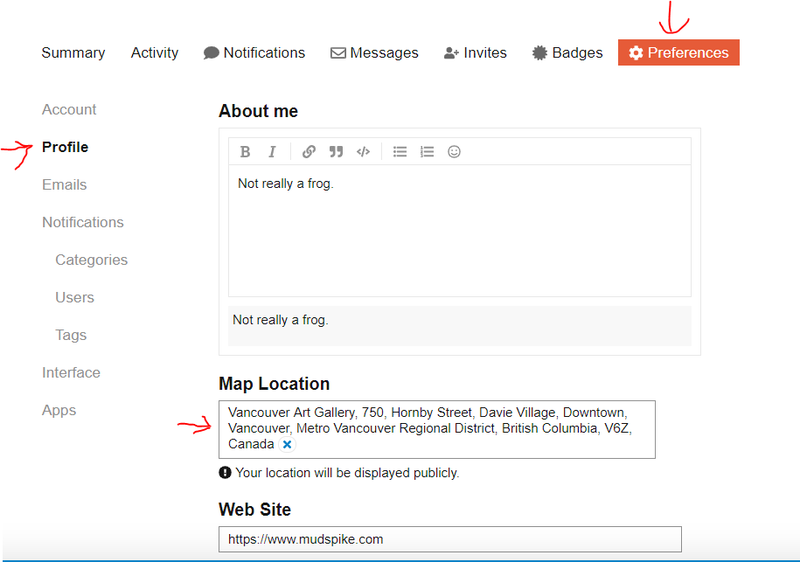 To fill in your current location in the Event, update your Profile to have a ‘Map Location’. You can enter in a Lat/Lng or an address, and it will work out what you mean. Don’t forget to hit ‘Save’ when it looks ok. If this gets used and is useful then we can expand it out a bit, so this is more just a quick experiment and a bit of fun. I like it, staged at Mildenhall. in the air, NDB only, no maps? Or only no maps showing your position? What aircraft are eligible for the air race? No GPS equipped (unless you turn it off) but anything else is good? I like real world weather…but I might not fly in real European time since much of my flying would be in the dark in that case. Cool…! My position is in there! Looks like a cool event… but I really don’t know what to pick pre-1934. Just Flight just released their VC10 Pro… but that’s too modern for a race like that. Darn… what am I gonna pick? I am currently searching through X-Plane.org for something that fits. The Staggerwing would work…looks good and flies good. I thought the cockpit was a smidge dark…and it has an unusually large right rolling tendency that might be an old XP10 artifact. Great - I’ve updated it to look like a suitably epic map for the journey. I renamed the labels to say it is an ‘Event Map’ as well. Good luck all and fair winds! PS @BeachAV8R, could you update your first post to mention the marking on the map and its location for latecomers please? No maps that show your current position, so feel free to bust out a static VFR chart. Weather is your call so long as it’s in the Spirit of Fair play, so if it’s a beautiful early spring day and you want to fly in a blizzard knock yourself out. In short don’t try to gain an advantage. Pre 1940 that opens it’s up a bit more for yeah. Also a reminder to everyone if you’re in the Air Race class you can still switch AC whenever you like so long as they are class eligible. Got it…and done… One question…I could not find a direct link to the map from the “Hamburger Menu”…I’m on the Airbus theme…should there be one there or are you talking about just accessing the user settings? The ‘Users’ entry on the hamburger should go straight there. Not perfect but for now ok.
@Cygon_Parrot is apparently not at the airport…he is in town at a pub. 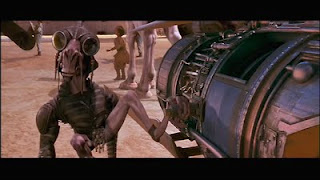 He gets an 8 hour bottle to throttle penalty…we got the jump on him boys! Yeah there are two of 'em in the X-plane store. One (the AT-11) is from the early/mid 40’s as a bomber/navigator trainer (tail dragger so I am thinking upgraded engines at best from the 37/40’s model) and a D18S which is from 1955+. I may have to settle for a 1940’s aircraft in X-Plane 11. Anything older is problematic (and X-plane 10 based it seems). Just remember that the Shade Tree Planes, while appealing to me, aren’t exactly the cutting edge graphics that you’d see with Carenado or some of the more modern production houses. Not to dissuade you…but take a look at some videos and stuff online before you decide.